Watercolor paint comes in a range of varieties, so if you're not sure which paint to buy, this page will provide you with a quick introduction so you can get the paint you need and start painting your masterpiece! Watercolor paint contains two main ingredients: finely ground pigment (which provides the color) and gum arabic (which acts as a binder). Manufacturers also add a wetting agent to facilitate flow and absorbtion, and a moisterizer to stop the gum binder from becoming brittle. The cool thing about using gum arabic as a binder is that you can thin watercolor paint with water to create translucent, transparent washes without compromising its ability to adhere to the paper. Although this allows you to create interesting effects, the fluidity of watercolor paint sometimes makes it a challenge to work with... but most watercolorists consider this part of the fun! My painting of Florence using watercolors and pen & ink. 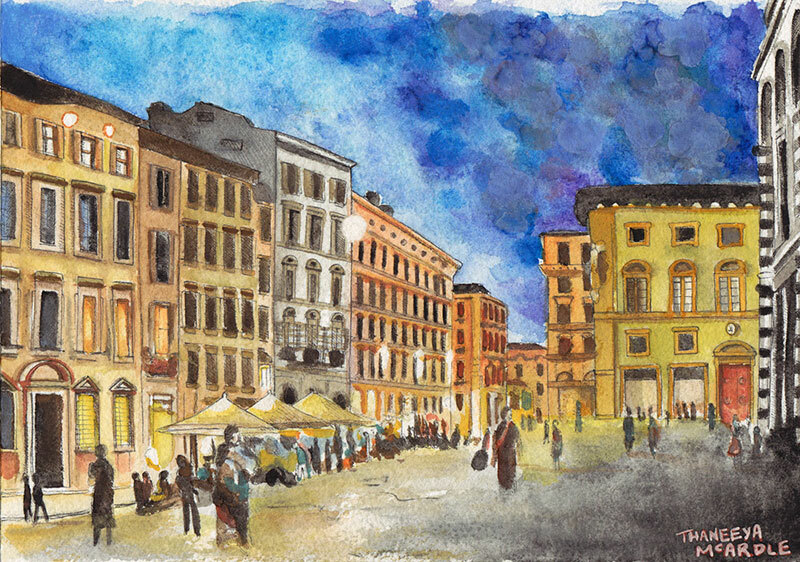 With watercolors you can paint in virtually any genre, from landscapes and cityscapes (like my painting of Florence above) to vibrant abstracts and sharp photorealist paintings. They're non-toxic, easy to clean, and with proper planning you can paint quite quickly. 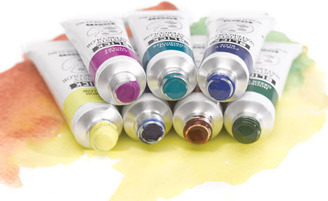 This page will take a look at the following attributes so that you can make an informed choice when you buy watercolor paint: Quality, Color, Permanence, Transparency, Staining, Pans or Tubes, and Brands. 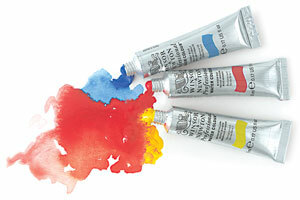 Like acrylics, you can buy watercolor paint in artists' quality and students' quality. 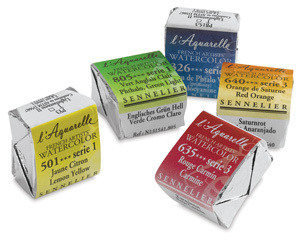 Artists' watercolors have a higher concentration of finely ground pigment with high permanence ratings. 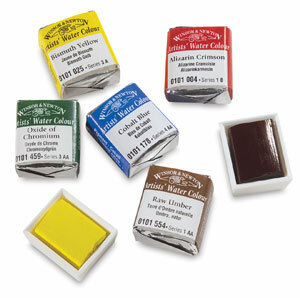 Students' colors may contain cheaper pigments and more fillers and extenders. 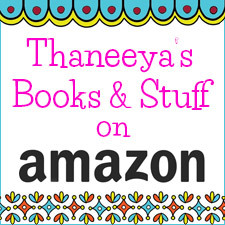 Your choice depends on your budget and your artistic aims. Artists' quality watercolor paint is obviously more expensive, but you get your money's worth in terms of permanence, intensity, and superior transparency. 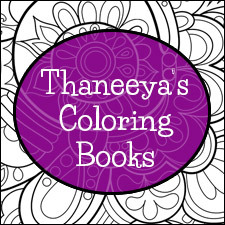 If you're a beginner just looking to experiment with new media, feel free to start out with with students' colors. As you continue to experiment, buy a few artists' colors and judge for yourself how much better they look. But even if you don't notice a difference, remember that artists' colors will last a lot longer. This is important if you want to create paintings that will last for generations. There are a lot of colors to choose from and their characteristics vary by manufacturer. Technically you can produce every color by simply mixing primary colors (red, yellow and blue), but the mixed colors will be dull and lifeless. Single pigment colors are much more vibrant and intense. 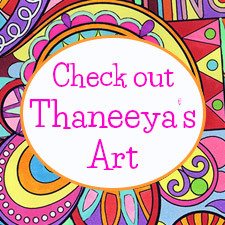 One of my watercolor abstract paintings. Most of us can't afford to buy every color, so there's a lot to consider when it comes to building a limited but versatile color palette. But don't stress because there's no "right way". There are objective measures, like permanence and transparency, but choosing colors ultimately comes down to personal preference. Ask 10 different artists and they'll each list a different color palette. Some will use only 10 colors while others might use over 50! One artist might prefer cadmium red but another will favor winsor red. You get the point. You just need a basic color palette to start off with and as you gain experience and accumulate other colors, you'll figure out what works for you and what doesn't. 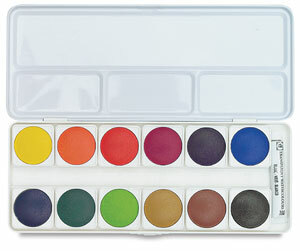 If you're buying your first watercolors, start off with an artists' quality set or students' quality set (depending on your budget) from a reliable brand and you'll have a good starter color palette that you can add to as needed. If you want to buy your tubes separately here is a sample color palette you can use as a guide. There's a combination of transparent and opaque colors and each can be mixed to create different hues. These aren't set in stone as "the best" colors, just a sample range which you'll need to build on. You'll notice above that there isn't any black or white. Some artists buy single pigment black, but it can also be created by mixing primary colors together. You can also buy white paint but most watercolorists (especially the purists) prefer to use the white surface of the paper. Color names. Be aware that the color names aren't consistent between brands. Two different manufactuers may use the same color name but use different pigments that produce different hues. So if you like a particular color but want to try it with a different brand look for the specific pigment it contains (typically a code name like PR108). Pigment cost. Some pigments are scarce or hard to mine, which makes them expensive. This is why some artists' quality colors might be much more expensive than others. Because of this, colors are classified by series: 1 is the cheapest and 5 is the most expensive. Alternatively, students' colors are all priced the same. Manufacturers can do this by substituting the expensive pigments with synthetic alternatives which do a good job as stand-ins, but can sometimes lack vibrancy and lightfastness. If you see the word "hue" after the pigment name you know that it's a substitute for real pigment. Permanence refers to the ability of the paint to withstand exposure to light and humidity without fading, darkening or shifting color. Also called lightfastness, this quality is important whenever you're not practicing. Who knows how future generations may value your art, so why not make it last? Look for the ASTM rating on the packaging and accept nothing less than "Excellent" or "Very Good" lightfastness. My "Jar of Marbles" watercolor painting. Watercolor paint is valued for it's transparency: the ability of light to pass through the paint and reflect back off the white surface of the paper to create a wonderful luminescent effect. See my "Jar of Marbles" painting on the right, which was creared entirely with watercolor paint. 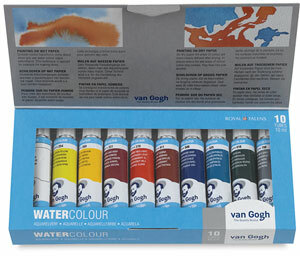 You can also purchase opaque watercolors, but if you're just starting out, don't worry too much about this distinction. Some purists don't believe in using opaque watercolors at all. With practice you'll learn to exploit transparency to enhance your watercolor paintings and to know if you need opaque colors. You do need to think about the transparency of the paint when it comes to layering. It's important to plan ahead and layer transparent colors before opaque colors because they won't show up the other way round. You can make opaque colors more transparent by thinning them with water but this can diminish their intensity. So how do you know which are transparent and which are opaque? You'll come to learn which pigments are usually transparent but there is variance between manufacturers. They will usually tell you on the tube or pan if the color is transparent. 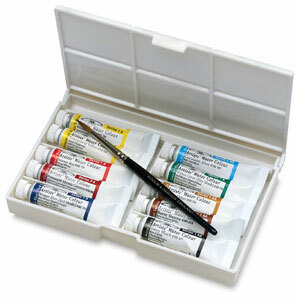 For example, Winsor & Newton mark transparent paints with a little white square and opaque colors with a black square. If transparency isn't indicated, look for the manufacturer's information booklet (like this one from Winsor & Newton) where they explain the characteristics of their paints. Finally, many experienced artists like to test new paints before they risk using them on a painting. The test for transparency is simple. Use a permanent marker and draw a wide black line across a piece of paper. Stroke each color over a section of the line and after they're dry you can identify the transparent colors as those which seem to disappear on the line and the opaque as those which are visible or leave behind sediment. Some watercolor paints penetrate the fibers of the paper and "stain", while others dry on the surface and are easy to scrape off or remove with a sponge. All pigments fall somewhere along the continuum between staining and non-staining. If you're buying paints for the first time, don't worry about this, but if you know you'll be using layering or "lift-off" techniques you'll want to make sure you have a good mix of staining and non-staining colors. Knowing which of your colors are staining and which aren't is handy if you're going to be scratching paint off the paper to revel reveal the white underneath or the light tint of the remaining pigment. One way around this consideration is to use masking fluid. Staining is also a factor when layering paint. Some non-staining pigments may lift and mix with layers placed on top, thereby muddying the colors and hindering luminosity. Unfortunately it's not easy to know which are staining colors and which aren't because it can differ by manufacturer. Most watercolorists like to test their colors beforehand on a separate piece of paper. Just let the paint dry and see how much pigment remains when you scrape or sponge it off. These precautionary measures are worth it because mistakes with watercolor paint can be hard to undo. You can buy watercolor paint in bottles, as sticks and even pencils, but by far the most common way is to buy it in pans or tubes. Pans are small rectangular or circular trays that contain solid blocks of paint that are re-awakened with water. 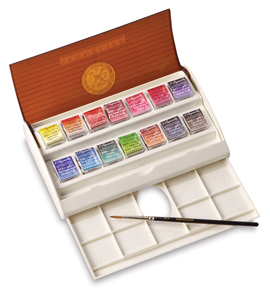 They usually come in sets, but some manufacturers, like Winsor & Newton, offer individual pans for artists' quality watercolor paint. Pans are portable and great for outdoor use. 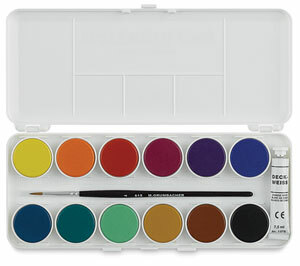 They're also economical because you can only take so much pigment from the pan to the palette each time. But this means they aren't as suited to large washes and mixing. 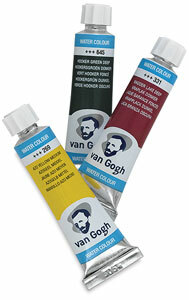 Tubes contain moist, paste-like watercolor paint and range in size from as small as 5ml right up to 37ml. 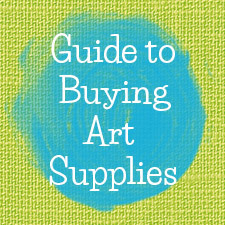 They can be purchased individually or in sets and are favored by artists who like to work in a studio on large paintings utilizing broad washes. It's easier to waste paint from tubes by squeezing out too much, but if you're an artist who uses a lot of paint, you'll need the convenience of tubes. The paint in pans and tubes does not differ in terms of quality, but one disadvantage of watercolor paint from tubes is that it's not as suited to re-wetting. If it dries out on the palette you can make it soluble again with water (like you can with paint from pans) but it takes a bit more effort, so it's tougher on the brush. Tube paints also contain fewer preservatives, and when you re-wet with water you could be adding mold into the mix. Tube colors can also become duller after frequent re-wetting and can also become crumbly. Ultimately, your choice depends on your work habits. If you paint smaller pieces and prefer the outdoors you'll find pans most suitable. 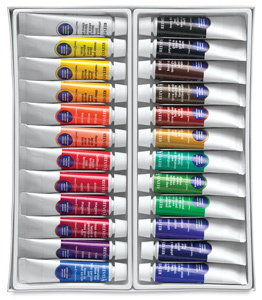 If you work in a studio or paint large paintings, you'll find tubes more convenient. If you're just starting out I'd recommend you begin with a simple pan set which will be economical and easy to experiment with. Once you get a feel for the medium you can start investing in some tubes. The quality and characteristics of watercolor paint will differ between brands, but this doesn't mean you can't mix and match. There isn't one brand that is the very best. Some manufacturers will excel at producing certain colors but disappoint with others. It really comes down to personal preference. I encourage to you experiment with different brands and see what strikes you. 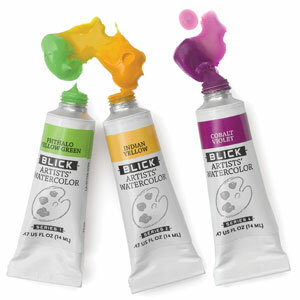 Once you've settled on colors you like, you can start saving some money by buying them in the larger tubes. 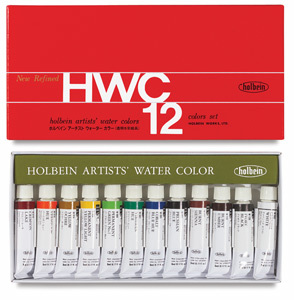 If you're really hankering for a recommendation or a place to start, try Winsor & Newton or Holbein for artists' quality and Winsor & Newton Cotman or Van Gogh for students' quality watercolors. These brands are well-received by artists, but by no means the only viable options (see below for more).